There is a mental health crisis in the black community, which calls for improved cultural competency training for all psychiatrists as well as more openness among blacks to talk about these issues, said APA President Altha Stewart, M.D. She spoke on Thursday at a session on mental health at the 48th legislative conference of the Congressional Black Caucus Foundation (CBCF), an organization aimed at advancing the global black community by developing leaders, informing policy, and educating the public. Cultural competency training is aimed at helping health care providers understand patients’ values, beliefs, and behaviors so they can customize treatment to meet patients’ social, cultural, and linguistic needs. For black Americans, this means becoming more aware of the impact of community stressors and how these factors are contributing to their mental health problems, said panelists at the first-ever CBCF panel devoted to mental health in the black community. These factors include violence and trauma, racism, implicit bias, poverty, and limited access to educational, recreational, and employment opportunities, said Stewart, who is also the director of the Center for Health in Justice Involved Youth at the University of Tennessee Health Science Center. “Just being a black person in America can keep you in a constant state of rage,” she said, quoting James Baldwin. 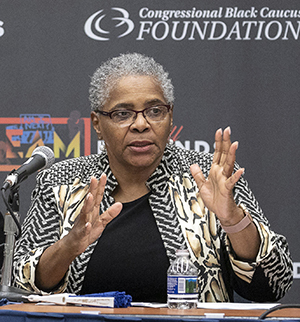 Patricia Newton, M.D., M.P.H., CEO and medical director of the Black Psychiatrists of America, told attendees that less than half of blacks with mental disorders get the care they need; that number drops to one-quarter when blacks of Caribbean descent are taken into account. Blacks are also more likely to be subjected to implicit—or unconscious—bias by clinicians, Newton added. “Very often, our people are misdiagnosed.” For example, blacks with depression are often misdiagnosed with schizophrenia and blacks grieving the loss of a loved one, who say they’ve experienced a “visitation,” have been diagnosed as psychotic, due to cultural and religious misunderstandings, she said. Making matters worse, blacks are more likely to be hospitalized for psychosis than to receive community treatment, she said.